RetroRewind is back! Get those hips swinging and those toes tapping! Set in the beautiful surrounds of Yanchep National Park, RetroRewind showcases the classics of days gone by featuring music from a toe-tapping era. Gimme some skin! Retro Rewind is back for 2019 and it’s sure to be outta sight! Set in the beautiful surrounds of Yanchep National Park, Retro Rewind showcases the classics of days gone by. This year is sure to be a blast with the funk tunes of Hornography, the supersonic rockin’ rhythms of Peta Lee & the Sultanas of Swing as well as the rockabilly toe tapping fun of the Rough Housers. As an extra treat this year will also feature the foxy and colourful Beehives Go-Go Dancers! 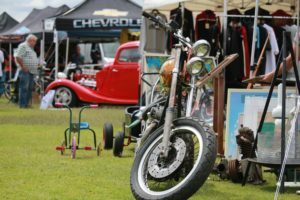 With free children’s entertainment including arcade games, face painting, bouncy castle as well as the pin up parade, show and shine and featuring vintage exhibitors selling their wares this is simply a family fun event not to be missed. Hey man! That’s boss! The event is free and park entry fees will be waived specially for event attendees from midday. The event is outdoors and we have had an explosion of attendee numbers in the last two years. Set in the stunning and natural setting by the lake and historic Inn we are please to confirm our involvement as the booking arm for this premier event. Link to our Facebook event page.